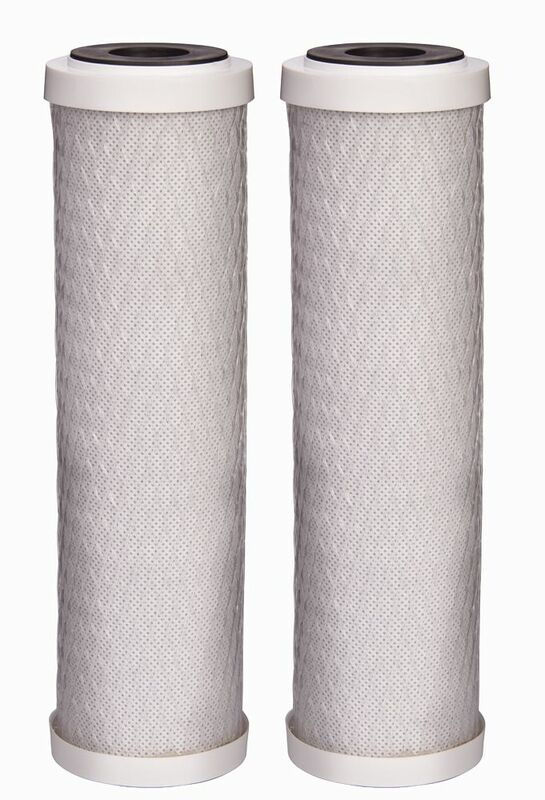 These filters fit any major brand of drop-in style reverse osmosis filtration systems and last up 6 months. They are NSF certified and reduce sediment as well as chlorine taste and odour. The UF-35 replacement filter pack is compatible with the Coral UC300 under counter water filtration system. The UF-35 filter set is tested and certified by WQA (Water Quality Association) to NSF/ANSI standards 42 & 53 for the reduction of Chlorine, taste and odour, Chloramine, Particulate Class I Particles, Cysts, Mercury, Lead, MTBE, Turbidity, Asbestos, and a full list of VOCs (see our Performance Data Sheet for the full list of contaminates reduced). The UC300 triple filter system has also been tested and certified by WQA according to NSF/ANSI 372 (low lead compliance) and CSA B483.1 (Canadian requirements). Coral's UF-35 three filter set consists of a Sediment filter, Pre-Carbon filter, and Carbon Block filter and is designed to last 12 months with a 600 gallon capacity. This premium HDX replacement refrigerator water filter fits in place of Samsung HAF-CIN. Engineered with the power of coconut shell compressed carbon block, this filter provides tremendous capacity to reduce impurities, sediment and rust that may be present in your drinking water. The carbon block has millions of active sites on its surface and within the structure which can absorb impurities like a sponge, and can hold other types of impurities on its surface like a magnet. Additionally, this filter can catalytically breakdown other impurities similar to the way a catalytic converter works in your automobile. These processes ensure that you are getting the cleanest and best tasting water possible. This economical filter will provide fresh and clean tasting water and ice cubes. Fits most other RO systems that use standard sized filter housings.- 6 piece of 5 Micron Sediment Filter: With only five micron rating, it is effective in removing dirt, rust and sand particles. Replace every 6 months.- 6 piece of Granular Activated Carbon (GAC) Filter: Adsorb chlorine, halide, organic contaminants, odours, and other impurities that contribute to bad taste and odour. Replace every 6 months.- 6 piece of 5 micron Carbon Block Filter: Remove any remaining chlorine and organic chemicals. Further enhance the taste of water. Replace every 6 months.- 1 piece of 75 GPD Reverse Osmosis Membrane: A thin film composite (TFC) high quality membrane that processes 75 gallons per day. It rejects wide spectrum of impurities down to .0001 micron. Tested by independent third-party to meet NSF/ANSI Standard. Replace every 24-36 months.- 3 piece of Post Carbon Inline filter: Removes objectionable tastes and odours to enhance the quality of drinking water. Replace every 12 months. Reverse Osmosis Replacement Filter Set - Drop-In These filters fit any major brand of drop-in style reverse osmosis filtration systems and last up 6 months. They are NSF certified and reduce sediment as well as chlorine taste and odour.